DIESE WEBSITE IST ALS FOTOARCHIV KONZIPIERT, DAMIT UNSERE HAUPTSEITE www.LivingStarTrekModels.eu ENTLASTET WIRD UND ÜBERSICHTLICH BLEIBT. AUCH EIN ZÜGIGER DOWNLOAD SOLL SO GEWÄHRLEISTET BLEIBEN. THE CONCEPTION OF THIS WEBSITE IS AN ARCHIEVE FOR PHOTOS TO GET A BETTER DOWNLOAD SPEED. OUR MAIN HOMEPAGE IS www.LivingStarTrekModels.de ! 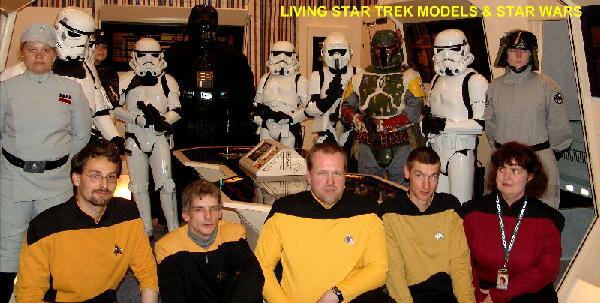 For contact with Living Star Trek Models please send a email to Torsten@galaxy-class.de or Frank@galaxy-class.de . If you want to contact some of our crew please write to Yen-Chih@galaxy-class.de (for interactive lcars programming). Please visit our MAIN HOMEPAGE: www.lstm.info ! YOU CAN DOWNLOAD AND PRINT EVERY PHOTO YOU SEE IN THIS WEBSITE FOR YOUR PRIVATE USE WITHOUT ANY CHANGES ONLY !! SELLING OR COMMERCIAL USE ARE PROHIBITED ! IF YOU WANT TO USE ANY PHOTO FOR PUBLIC MAGAZINES OR PRINTS, FOR MAKE A CD/DVD PHOTO/VIDEO-COLLECTION (IF IT IS NOT ONLY FOR PRIVATE USE), OR IF YOU BROADCAST ANY PICTURE FROM THIS WEBSITE YOU MUST FIRST CONTACT WEBMASTER@GALAXY-CLASS.DE ! STAR TREK, PARAMOUNT PICTURES AND FEDCON ARE REGRESTED TRADEMARKS.